San Diego, Calif. — Malin Burnham, one of San Diego’s most renowned philanthropists and business leaders, and the author of recently-published book “Community Before Self,” received the 2016 Humanitarian of the Year Award, presented by the Sanford Institute of Philanthropy at National University. This award is granted to a person with a demonstrated commitment to giving back to others and to the community through philanthropy for the betterment of our society and humanity. Previous recipients of this award include T. Denny Sanford, for whom the Sanford Institute of Philanthropy was named, and the late Conrad Prebys. Mr. Burnham is recognized nationally for his generosity of spirit and leadership. His extensive community involvement has included bringing the America’s Cup races, the USS Midway Museum, and the U.S. Olympic Training Center to San Diego County. He has also been a board member of numerous major corporations and firms, chaired non-profits and co-founded more than a dozen organizations in his career. To name just a few example, he founded the Burnham-Moore Center for Real Estate at USD, and the Malin Burnham Center for Civic Engagement at the San Diego Foundation. His impacts go beyond San Diego. More than one million lives are estimated to have been saved each year through the Sanford-Burnham-Prebys Medical Discovery Institute. The evening included a presentation by Mr. Burnham, followed by a Q&A. During this time, Mr. Burnham highlighted key points from his new book and shared some of his guiding principles with members of the San Diego community. Mr. Burnham also emphasized a need for nonprofits to strengthen their fundraising process by incorporating business and sales strategies, an approach that is taken by the Sanford Institute of Philanthropy. Based at National University, which is among the largest private nonprofit universities in California, the Sanford Institute of Philanthropy offers educational and training programs to help nonprofits significantly increase their fundraising capabilities and their positive impacts on society. 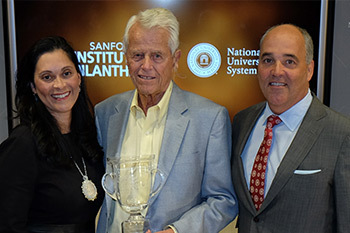 Based on the vision of philanthropist and entrepreneur T. Denny Sanford, the first Sanford Institute of Philanthropy launched at National University in 2014 with the development of proven contemporary curricula presented by recognized nonprofit leaders, faculty and renowned philanthropists. National University is leading the expansion of a network of affiliated Institutes of Philanthropy in coordination with other educational institutions. A common cornerstone among each Institute is the Cause Selling approach toward fundraising and donor relationships that blends the passion of philanthropy with an emphasis on proven business principles.